Elvis and the Mexican Bracero (1956) - do we believe it? Gregory Nolan Jr posted this interesting, if incredulous, article on the FECC board. At one time Don Pedro Gómez dreamt of becoming a famous star. From a very young age he learned to work in the fields on his fathers ranch in "Los Hernández," Guanajuato. Then, when he came of age, he enrolled as a bracero, initiating a new life; over 40 years of agricultural work in the United States. And although he did not become a famous star, Don Pedro can boast to being probably the only Mexican farmworker to have sung a duo with the king of Rock and Roll, Elvis Presley himself. This encounter between the "King" and Pedro Gómez occurred in 1956. It was his second contracted year as a bracero. He was about 21 years old and working along side his father, Pedro Gómez Domínguez, on a ranch belonging to W.G. Cunningham in Levelland, Texas. At that time Pedro knew some English, since his girlfriend, Manuela Rivera, was teaching him little by little. Also she had written down for him a very popular tune of Elvis's "Love Me Tender," which Pedro soon memorized and sang, according to him, just as good as the "King" himself. One day, Pedro accompanied his father and other braceros to Lubbock, Texas. They would come periodically to buy food, and other articles, cut their hair, send money home, and have a good time. 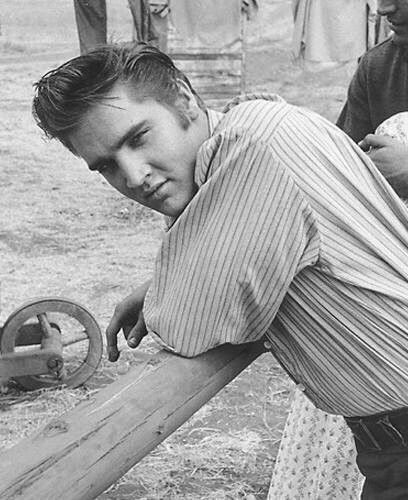 It turns out that the main movie house in Lubbock was presenting the film "Love Me Tender," and as a special attraction Elvis would be there live. Pedro didn't think twice and asked his father's permission to go see the movie and meet Elvis in person. At first Pedro Senior did not think it was too good of an idea, but in the end he gave his permission recommending that he stay out of trouble. They decided Pedro Senior would wait outside. The theater was packed and ready to explode. The young ladies in particular, went hysterical every time they heard Elvis's name or his voice. Pedro was probably the only Mexican in attendance, and certainly the only bracero in the theater. He got a seat right in the middle of the hall. The ambience inside and surrounding the theater was very festive and noisy, extremely unlike Lubbock; a tranquil and conservative town in the panhandle region of Texas. From within all this excitement, the film began to roll. The public couldn't miss a second of the movie and the excitement escalated up until the long awaited moment; the intermission during which Elvis Presley would make his appearance. As Elvis, in the flesh, came out from behind the curtain a collective roar shook the entire theater. When he greeted the crowd, everyone stood up. The applause and the shouting from the audience was deafening. The young ladies in the front row were screaming and extending their arms towards the "King," trying to touch him. Some of them cried and there was at least one case of fainting. Elvis asked for silence and the noise decreased a notch. He was going to sing the theme from the film, "Love Me Tender," and standing in the middle of the stage he asked the crowd if anyone would come up and join him. The room went silent and nobody answered. Elvis asked a few times: "Nobody?" With that Pedro Gómez got up off his seat, yelling and wailing his arms, to make himself seen amiss the noisy crowd, he screamed: "Yes, I do, I do!" The very energy of the crowd forced Pedro Gómez to the front of the stage, where he could be close to his idol. Elvis greeted him and asked him if he could speak English. "Little bit," Pedro nervously answered. The young bracero was star struck , it all seemed like a dream. Elvis asked him a few more questions and when Pedro told him he was a Mexican bracero, people in the crowd screamed "Viva Mecsicou!" to which the entire audience applauded. Elvis gave him instructions on how to accompany him in the second voice, and warned him that once the young ladies began trying to get on stage, he should jump to the back of the stage to be safe. The song began and sure enough, as the excitement grew it looked as though nothing was going to stop the compact group of youngsters in the front row. The young ladies began attempting to get on stage, and when Pedro felt the crowd coming he jumped to the back of the stage looking for safety. 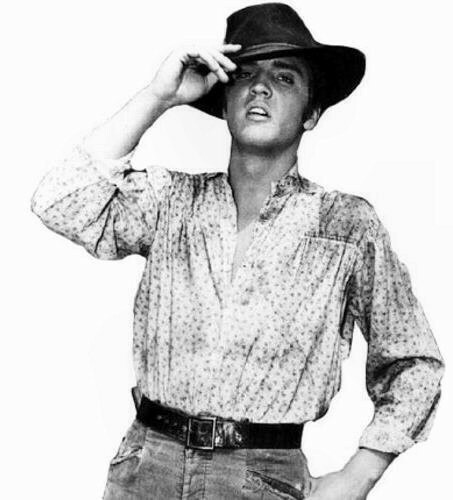 He caught a glimpse of a large group of sheriffs struggling to rescue Elvis from the hands of his admirers. It was total euphoria, everything around Pedro was spinning, and he escaped as best he could. When he got out, his father was waiting for him across the street. As he got closer he noticed a certain worry and anxiety in him, and he asked him if he was al right. "Is it true you got up on stage to sing?" Don Pedro asked. Since the reply was a positive one, his father simply told him: "Do not get into any problems... Remember we have a commitment to Mr. Cunningham..." Like a good son, Pedro Gómez told his father he was not planning on deserting or violating his bracero contract. Once this had eased his father's mind he gave him a friendly pat on the back and said: "Well, forget it, lets go have dinner..."
"Elvis is the 'glue' which holds our society together....which subconciously gives our world meaning"
"And don't think for one moment he's just a passing fancy....he's got enough of it to keep him on top for a long time"